CenTrak launches healthcare’s first location-based scope management system, offering improved patient safety, equipment workflow and security. Innovative Medical Scope Management System features miniature, durable tag capable of withstanding High-Level Disinfection (HLD) and is fully interoperable with CenTrak’s Clinical-Grade Real-Time Location System (RTLS)™. (Newtown, PA – April 7, 2015) – CenTrak today announced the availability of its Medical Scope Management System, designed to help address one of healthcare’s most pressing challenges – the real-time and automated tracking of scopes through their usage, cleaning, and storage lifecycle. 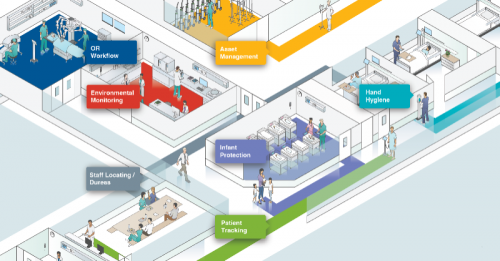 Notable healthcare facilities have already adopted new scope-cleaning protocols, further supporting the case to monitor scope lifecycle events with RTLS. CenTrak’s Medical Scope Management System represents healthcare’s first practical tracking technology for medical equipment that requires High-Level Disinfection (HLD). The system includes a number of innovative components, which operate in conjunction with CenTrak’s market-leading Clinical-Grade RTLS infrastructure. The new technology is designed to provide certainty-based workbench-level resolution, even when reprocessing areas are inches apart. Most noteworthy is CenTrak’s introduction of the DuraTag, an active RTLS tag not much larger than a quarter, which can easily and safely attach to a scope, and is capable of withstanding the high-pressure washing and harsh disinfection chemicals commonly used during HLD. The DuraTag is also ideal for stretcher and wheelchair management, as those assets often require high-powered water jets for cleaning. The development of this rugged, high-performance tracking system was driven by demand from leading commercial and government hospitals, outpatient facilities, and CenTrak solution providers who are determined to improve the efficiency and safety of healthcare delivery. The Medical Scope Management System is compatible with battery-powered Gen2IR and Low Frequency technology installed in CenTrak’s 600+ commercial and government accounts. CenTrak’s Medical Scope Management System will be featured at HIMSS 15 in booth #4609. Clinical-Grade RTLS™, Clinical-Grade Visibility™, Clinical-Grade Locating Solutions™, Gen2IR™ and CenTrak® are trademarks of CenTrak Inc.